It is time to revolutionise the way that you do business with Sage 200 Evolution. By bringing all the aspects of your operating environment together, Sage 200 Evolution is a Business Management Solution that gives you the ability to control your financial situation as well as your relationships with your customers, suppliers and employees. 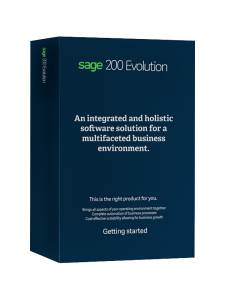 Sage 200 Evolution is built with a wide range of features and functionality, complemented by a number of add-on modules allowing the solution to be a scalable, flexible and a robust management tool for a growing business. Integrated Business Activity Management functionality is woven into the core accounting package, providing you with a holistic view of your business as both accounting and operational data reside in the same system. Unlike other vendors who bill extra for support services and demand large teams of expensive skills to deploy a Business Management Solution functionality, our solutions offer the lowest total cost of ownership because they are quicker to deploy and requires less configuration / training. With many years of experience in software development and with thousands of businesses using our software, Sage Pastel has an in-depth understanding of what makes software usable and flexible. Sage 200 Evolution is both intuitive and easy to implement and use. Sage 200 Evolution has a range of add-on modules that cater for industry-specific needs. The modules seamlessly integrate with Sage 200 Evolution’s core financials, are cost-effective and can be rapidly deployed. Sage 200 Evolution Intelligence Reporting allows you to manipulate data in any way you need. Design specialised reports that give you a competitive edge. See trends in your business that would otherwise be difficult to recognise. Slice and dice data through “what-if” scenarios enabling you to run ideas through your financials. Sage 200 Evolution gives your business the competitive edge. It is a very powerful tool that allows you to track, analyse and manage customer and supplier interactions within your business, allowing you to be proactive in meeting and exceeding their demands. Sales Force Automation helps you track and manage sales opportunities which are very precious in today's competitive business environment. Use Sage 200 Evolution's unique Business Activity functionality to set and manage employee tasks and productivity. View graphical representations of which activities have been closed and which are still open. Preferred Solutions is the Top Sage Evolution Business Partner in the Western Cape for more than 10 years running, and a leader in Sage Evolution sales, consulting and support in South Africa. With our experienced, expertly trained support staff and consultants, you can be sure that you are always in the best hands. It is time to revolutionise the way that you do business with Sage 200 Evolution. By bringing all the aspects of your operating environment together, Sage 200 Evolution is a powerful Business Management Solution and ERP System that gives you the ability to control your financial situation as well as your relationships with your customers, suppliers, and employees. The System Manager is the control centre for the entire Sage 200 Evolution application. It is the system’s user interface. Featuring a System Tree for navigation, it also controls the system environment and set up, online help and multi-level password security. Sage 100 Evolution delivers enhanced efficiency, productivity and security to any business. Your data is your data! We understand the need for confidentiality within your business. You need to control access to this information. Sage 200 Evolution features multi-level, menu-driven password access control. Sage 200 Evolution also enables you to control who sees what with password protected menus. Eliminate internal fraud and unauthorised transacting within your business with the System Audit Manager. This tool assists you to track and manage database activities for all or selected database tables allowing you to report on detail changes for both transaction and master file tables. Password Complexity enables you to enforce specific password combinations which can be aligned to your business’s IT protocols. The Agent Lockout feature allows you to control users entering their passwords incorrectly by specifying lockout attempts and durations. Seamless integration with MS Office means that you can e-mail any report. You can use several standard formats such as HTML or PDF. You can also export data into Word or Excel, where you can perform your own complex data manipulations. This feature complements Sage’s extensive range of management reports. The Contact Manager module integrates e-mail management with Microsoft® Outlook. You have the ability to view graphs. For example, you can compare General Ledger account movements over a period of five financial years. You can compare sales and purchases in the Orders module, and you can view incident analysis in the Contact Manager module. The Report Writer module allows you to customise standard reports per user as well as stationery layouts per user. It integrates into every module in the Sage 200 Evolution range. Sage 200 Evolution gives you instant access to customer and supplier balances, overdue totals and sales/purchases history. Drill down features and reports are available when you need a more detailed analysis of customer/supplier transactions. If you wish to analyse debtors and/or creditors in the General Ledger, you can use more than one General Ledger control account for Customers and Suppliers.This is over and above your normal reporting within the Customers and Suppliers ledgers. Work more efficiently within the within grids using the copy and paste feature from Excel in various inventory forms. Make quick changes in Excel and copy them back into Sage 200 Evolution. Dimension Items gives you the ability to stock items using specific dimensions such as m² and m³. You can specify buying and selling dimensions depending on the type of item and it’s perfect for environments where inconsistent measurements are sold based on client requirements. Define attributes per inventory item for more accurate reporting and maintaining of inventory items. Create an attribute group with attribute types to manage inventory a more granular level. This feature allows you to perform invoicing in stages, by issuing stock first, in cases where customers only wanting a consolidated invoice at month end or invoicing a customer first, before delivery of goods have taken place. The best thing about this feature is that it makes use of a Delivery Accrual account giving you peace of mind that your Cost of Sales account will balance at the end of the day. You can process Customer Goods Return Vouchers and Credit Notes based on the stage in which the stock was issued. With Multi-Warehousing, you can create multiple warehouses or stores and move items between these stores. Define multiple bin locations per warehouse to simplify physical counts and picking of inventory. Lot Tracking lets you track items by lot, where batches of items all have the same lot number. You can specify expiry dates and a status per lot number. Bill of Materials allows you to manufacture or assemble items from components. The system takes the component materials out of stock into work in progress, and then allows you to create finished items ready for resale. Pricing Matrix lets you have selling prices per inventory item or inventory group and per customer/supplier or customer/supplier group. These can be price or percentage discounts on the customer’s/supplier’s standard price. All these add-on modules work together. For example, you can manufacture serialised items into warehouses and track lot numbers. This new feature will form part of the core modules of Sage 200 Evolution. It allows you to manage your inventory levels by specifying minimum and maximum stock levels, minimum re-order levels and quantities. An automatic purchase order will be generated by the system, taking into account the preferred suppliers linked to the inventory item, lead times and reorder levels determined by your business’ standard operating procedures. Do you want a safe and secure payment solution for your business? Sage Pay has over 10 years experience in providing payment solutions to small and medium-sized businesses throughout South Africa. We are excited to announce that Sage Pay integrates with Sage 200 Evolution, allowing your business to receive customer payments, as well as make supplier payments in a few easy steps. You can also validate bank details and request credit risk reports via Sage Pay. To cater for the move by many businesses to increase staff productivity and become more efficient, the Alert Management module has been designed to streamline key roles within the business. The module allows you to receive notifications based on a set of predefined criteria to allow for better planning and control in your business. Alert Management allows you to send and receive notifications via SMS or email based on predefined criteria. This allows you to keep your employees, customers and suppliers up-to-date with business related information, account balances and inventory status updates. Also available as a mobile application. Sage 200 Evolution’s Mobile sales applications offers you online/offline modes, allowing the programmes to operate even when users are out of 3G range and still ensure an automated and seamless integration back into Sage 200 Evolution BMS. Available on Apple’s App Store and Google Play Store for Android. Users exceeding the free allocation of 5 devices, must be paid for. Please enquire with our sales team. We’ll make it easy for you to do business on the web and can also help you with social media and online marketing campaigns. We integrate all the relevant data with your Sage Pastel accounting package so that online orders and quotes feed straight into our software. So as you change information like product prices and stock levels, your online store will update automatically. Digital Marketing: You can easily reach your customers to cross-sell and up-sell your products and services. And, of course, you can promote your business to win new customers. Link your social media: Stay connected with your client base across the right social platforms. Optimised for online search: When they’re looking to buy, we’ll make sure customers can find you online. User-Friednly Site Builder: You can rely on our web design expertise and technical knowledge to build and manage your site. Manage your marketing: Track each marketing campaign with detailed stats, such as who received your mails, who opened them and who clicked through. You can then export a list of hot prospects and contact them to clinch the deal. Use the below links for quick navigation to the selected module, or scroll down to read more. This module allows for the cash book to be electronically populated when a bank statement is imported where large volumes of transactions are processed. Once verified, the information can be updated to a cash book batch and then to the general ledger. The bank statements are acquired by using a download facility that’s provided by each of the four major banks in South Africa (ABSA, First National Bank, Standard Bank, Nedbank). Supported formats include OFC, CSV, and ASCII. The advantages of using this module include the instant processing and coding of accounts once the initial process of assigning recurring coding has taken place, and the process of reconciliation and account coding is virtually guaranteed. Another benefit exists for transactions where the codes have been assigned as per the relevant accounts. Codes need not be assigned a second time – only new transactions have to be coded in the months to follow. The Kit Item Codes allow for the specification of one code on an invoice, and the system leads to multiple invoice lines that can include inventory items and remark lines. What’s new in Sage Evolution Business Gateway? The previous system was written using older technology which got in the way of new development. The new system is written using current best-practise technology and techniques which will make system maintenance. The previous system was very difficult to install. Installers needed fairly advanced knowledge of IIS and Component services. The new system is much simpler to set up. Dashboard landing page – provides a quick overview of current tasks and progress. Fully mobile – screens and charts can be viewed on devices like smartphones and tablets. Flash charts fall back to html5 so that they can still display on devices that don’t support flash. Statement drill-downs – this was the most requested feature for the previous version. Procurement – PO approvals provides access to approving managers that are rarely in the office. Much more administrative information and control. Both ‘soft’ and ‘final’ demand letters. Sage Pastel Debtors Manager creates reports to monitor debt collection progress, staff performance and accurately forecasts cash flow. With ready to run debtors management reports for every outstanding invoice, you can determine why the amount is outstanding; when it will be paid; what has been done and what still needs to be done. Get paid and improve your cash flow - with Sage Pastel Debtors Manager, there are no more excuses! The management of Inventory deliveries. Confirm partial deliveries and cancel deliveries. Search by invoice number, delivery method, item code or description. Generate delivery notes and re-print delivery notes. Generate reports on outstanding, partial and completed deliveries. *Sage 200 Evolution Fixed Assets can be used in conjunction with the core Sage Evolution Accounting system or can be purchased as a stand-alone product. Create by-products in addition to your main manufactured item. This module adds great flexibility to Sage 200 Evolution’s standard pricing feature. With this module, you can not only create volume-based or time-based price breaks you can specify discounts by customer or group of customers. In addition, you can design unlimited discount variations, such as multiple discounts per customer per stock item, and discounts per stock group while having the ability to override discounts on processing invoices. This module offers a three-tiered process that allows you to precisely manage the numerous purchase orders in your business and keep control of purchases either for internal purposes or specific projects. The first tier is the requisition process where the purchase of an item or consumable can be requested and routed to a head of the department for authorisation. The second tier allows purchase orders to be generated based on configurable rules. Different levels of authorisations can be administered and setup. The procurement process also validates all purchases against budgets set up in the general ledger. Traditionally termed ‘CRM’ or “Contact Management”, Sage 200 Evolution CRM is core to the Sage 200 Evolution systems functionality. Sage 200 Evolution CRM has taken the concept of traditional Contact Management much further by weaving it into the very fibre of the Sage 200 Evolution accounting system, thus elevating accounting software to its next logical state allowing you to not only capture numbers but also what we refer to as business activities. Activity data is integrated and presented together with the numbers providing a holistic view of your business instead of a numbers only view. This integration provides you with the ability to control not only your financial situation but your relationships with your customers, suppliers and employees. Any issue that takes place in a business, and is important enough to be tracked, is recorded as an Incident in Sage 200 Evolution CRM. Supply chain management can be regarded as one of the most heavily regulated and aggressively audited fields in the public sector. This requires a business software solution that caters for both operational functionality and statutory compliance. The Advanced Procurement module is a feature-rich add-on module, seamlessly integrating with the Evolution core. It allows you to create and approve requisitions, request and evaluate quotations and place purchase orders with preferred suppliers. This module allows you to establish credibility in the marketplace with your respective suppliers and stakeholders. Care has been taken to keep abreast of the ever-changing regulatory environment, ensuring compliance with PFMA, MFMA and PPPFA prescripts. Manage your requests for quotations from suppliers and allow the system to help you choose the most appropriate supplier quote based on criteria set up by you. Analyse your supply chain and manage your supplier’s performance on a rotational basis, by sector or specified supplier criteria. Fully integrated with Sage Evolution CRM Premium all movements are logged against incidents. Workflows and escalations can be configured to create efficiencies and automate purchasing processes. Branch Accounting enables bi-directional synchronisation and consolidation of data. Information can now be shared, consolidated and saved on both the centralised system at the head office as well as at branch level. For example, all financial, inventory and pricing data is always up-to-date and consistent across branches. Product prices can be changed at the head office level and automatically pushed to all branches. Branch Accounting includes the ability to transact at the local level even if the internet supply or virtual private network becomes unavailable. In addition, any potential loss of data due to fire or theft will be kept to a minimum, as regular consolidation and replication will house data at head office over and above any off-site backup processes. Data for a particular branch can be restored and sent to the relevant branch within hours of the loss. This add-on module lets you invoice jobs to customers. A job card is more powerful than an invoice because you can link more types of items besides inventory items in a job. For example, you can purchase an item directly for use in a job, and you can allocate employee hours from the Payroll module into a job. You can also invoice a job on a partial basis. You can allocate costs and measure the profitability of short to medium term jobs. Create an unlimited number of job cards, with the ability to archive these for future estimates. You can allocate jobs to projects on a job card basis or a job line basis. Third party software developers can use the Sage 200 Evolution SDK to create customer-specific applications that integrate with the Sage 200 Evolution ERP software system without the need for issuing direct SQL statements against the Sage 200 Evolution database or having to work out relevant business rules and processes for updating the accounting system. The Sage 200 Evolution SDK is typically used for transaction processing and account maintenance, and these records can originate from any external source, whether it is an external database, XML, web service, or custom user interface. The Sage 200 Evolution SDK consists of an Application Programming Interface (API) that exposes typical Sage 200 Evolution functionality to application developers. Sage 200 Practitioner: This comprehensive training course will give you a broad overview on how to use your Sage 100 software. Sage 200 Product Consultant: This comprehensive training course will give you an opportunity to familiarise yourself with the different Sage 100 add-on modules. Sage 200 Maintenance Technician: This comprehensive training course covers the maintenance activities and tools available for a Sage 100 environment. Sage 200 Bank Manager: This comprehensive training course will give you an opportunity to familiarise yourself with the Sage 100 Evolution Version 9 Bank Manager add-on module.